Candied nuts are addicting and perfect for snacking. 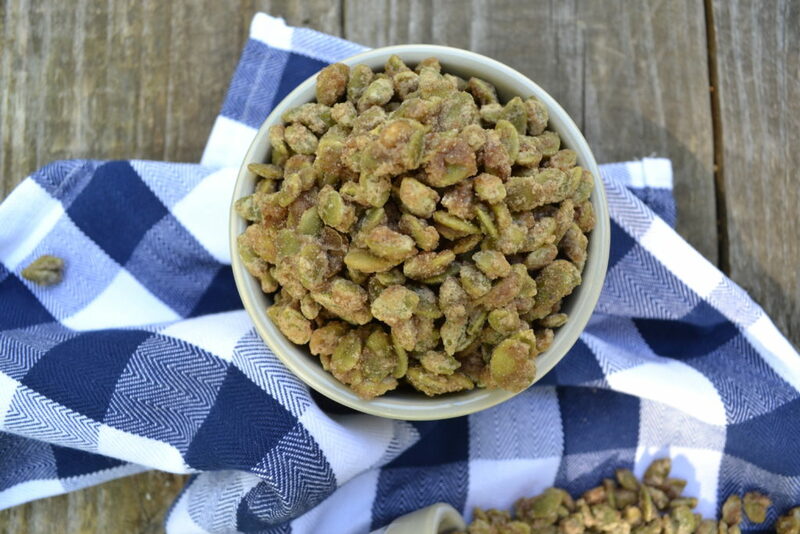 Pumpkin pie spiced candied pepitas are perfect addition to all of your fall treats! Sometimes I can get stuff done during nap time. It’s the occasional ability to knock out what feels like 1/3 of my to-do list during a one hour stretch that makes me ignore the advice that everyone gives a new mom – “sleep when the baby sleeps!” I’ve done it a handful of times when Ryan was a baby (mostly when I was pregnant with Owen) and a grand total of ZERO times since Owen was born, thanks to rare overlapping naps. But when naps do overlap, I immediately see it as the perfect time to get.it.done. The other day was one of those days. By some miracle, both boys went down for a nap so I got busy making soup (I was craving chicken and wild rice from Panera! ), cleaned the kitchen, AND made these baller Pumpkin Pie Spiced Pepitas. Does anyone else fall victim to those unbelievable smelling hot, candied nut stands in the city? You can smell one from a mile away and I will walk twice that just to get some. With that in mind, I thought it would be fun to add a fall twist to on of my favorite treats. Here’s the thing – candying nuts this way is super easy and just takes a few minutes. I’ve done it with almonds, pecans, and peanuts and – unless I forget about it on the stove – it’s pretty foolproof. 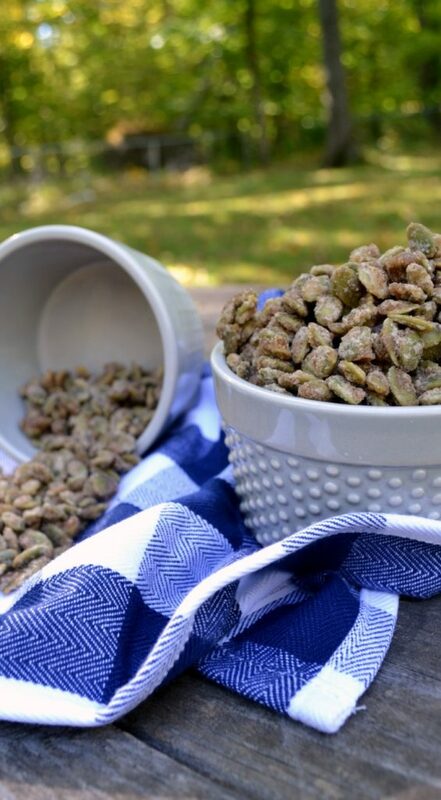 I knew that some candied pumpkin seeds would be tasty, and that with the addition of pumpkin pie spice it would be even better – yup, definitely right. In a large pan over medium heat, bring 1/3 cup of water and 1 cup of sugar to a boil before adding in 1 Tablespoon of pumpkin pie spice, an 8 oz bag of shelled pumpkin seeds, and 1/4 teaspoon of salt. Stir constantly, thickening the syrup. Breakfast: Flour tortilla, refried beans, eggs, cheese salsa. <– the best breakfast I always forget. Lunch: I made Alex bread. My lunch was bread. Plus picking at pepitas and the soup I was making for dinner. Dinner: I wasn’t stupid hungry (from all of the picking) but I couldn’t resist a bowl of the creamy chicken and wild rice soup I was making. 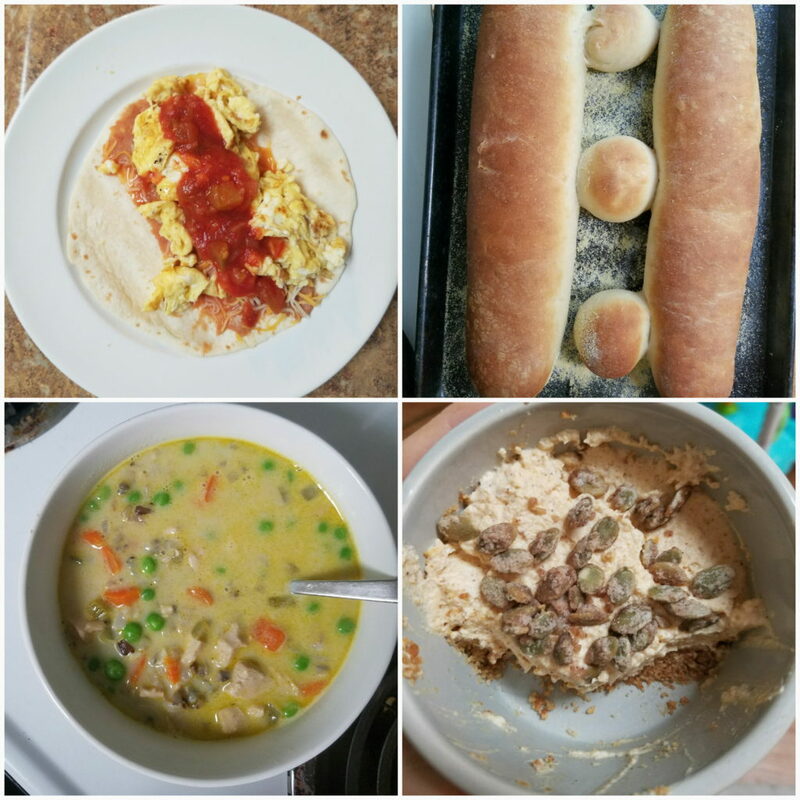 I mixed a bunch of different recipes, and it was so, so good. Lighting? Horrible. Eaten standing up at my stove? Always. Dessert: I put the last bits of a recipe I’m putting together for you all (with lots of candied pepitas ;)) in a bowl. The end. Okay, so tell me – do you love those street nuts? Mommas – do you nap during naptimes? Let me know in the comments! Oohhhhhh how delicous!!!! I buy the ones at Trader Joes, but I bet these are even better. 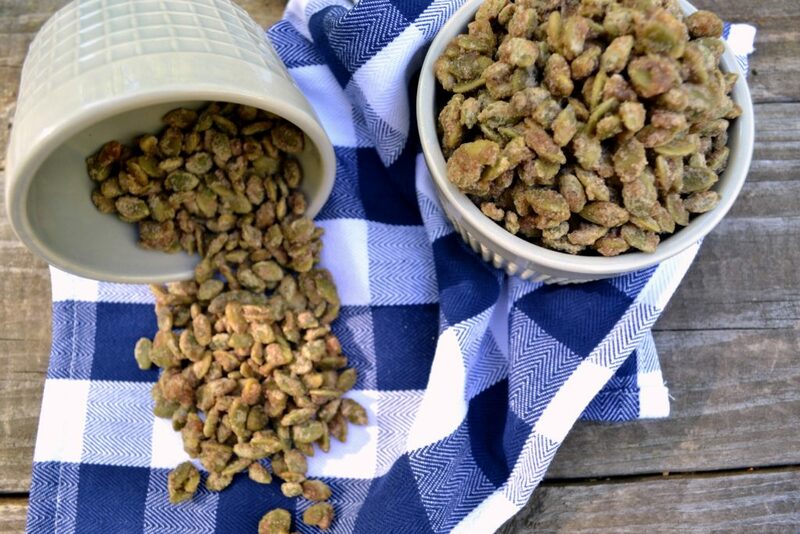 Perfect for snacking or a topping to a salad or soup. Candy Pecans are the perfect fall/winter treat. These look amazing! Oh Yum, what a special treat to share with us and thanks so much! Have a great week and hope to see you at Full Plate Thursday again real soon! I love pumpkin seeds! I had no idea until last year, i know – crazy right? These are making my stomach growl. Pumpkin spiced pumpkin seeds? Please, and thank you! Thanks for sharing with us this week at Celebrate Your Story, have a great week. 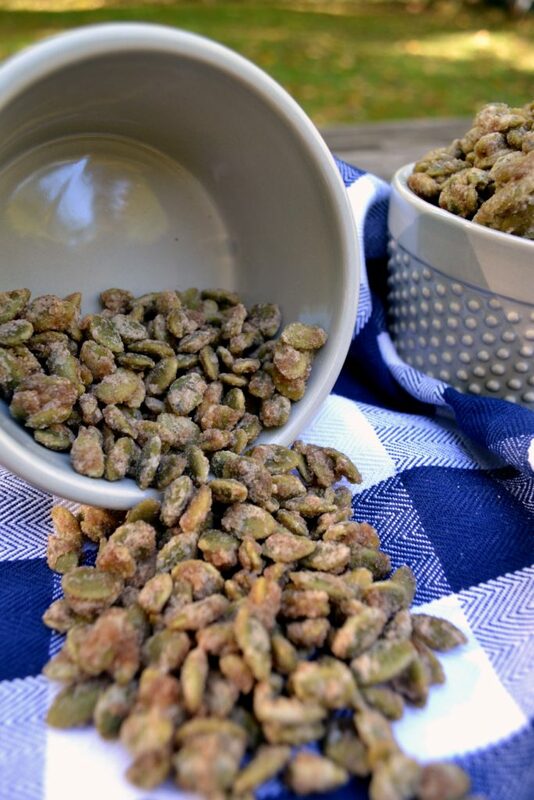 I have never tried pepitas, but wow, you have given me some fantastic recipes for trying them! 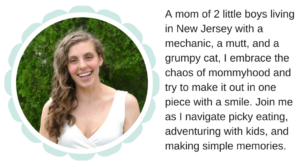 Thanks so much for sharing over at Celebrate Your Story! Candied nuts are my kryponite! Love your Pumpkin Spice Candied Pepitas, Morgan. Pinned. Thank you for sharing with us at Hearth and Soul.